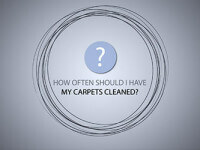 Professional carpet cleaning… how often? There’s a lot of misinformation going around about how often your carpets should be professionally cleaned to ensure a clean and healthy living or working environment. With many factors to consider, such as your carpet warranty, the level of traffic, kids, pets and other considerations, this video takes the guesswork out of determining the carpet cleaning schedule most appropriate for your needs. Scheduling frequent professional carpet cleanings is critical for people with asthma or allergies. Dr. Michael Berry, an environment and public health educator, writer and science advisor, noted in the Journal of Cleaning, Restoration and Inspection that “six different field demonstration studies over the past twenty-five years indicate that a properly designed and scheduled carpet cleaning program that emphasizes extraction” will ultimately improve indoor air quality. Watch this video to get unbiased recommendations for the frequency of carpet cleaning, based on empirical evidence, literature review and Dr. Berry’s own observations.